DALLAS (AP) Having no picks in the first three rounds made it look as though it would be a quiet, boring and ineffective weekend for the Calgary Flames. Lindholm is a natural center, but could be the perfect fit on Calgary’s first line alongside Johnny Gaudreau and Sean Monahan. 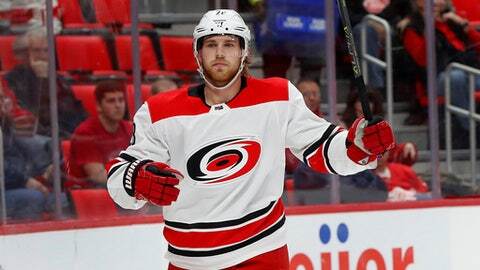 Moving Hamilton will allow T.J. Brodie to slide back on to the first defensive pairing with Mark Giordano, while Hanifin could benefit from playing with those veterans on the blue line. After lifting the Stanley Cup with the Washington Capitals, Grubauer was traded to the Colorado Avalanche where he’ll initially split time with Semyon Varlamov but should take over as the starter after next season. Grubauer signed a $10 million, three-year contract in the biggest payday of his career. They got strong value in first-round picks Oliver Wahlstrom and Noah Dobson, but didn’t agree to terms on a new deal with John Tavares before he could begin meeting with other teams Sunday. Tavares will host five teams in the coming days and could become a free agent July 1, which would be devastating for the Islanders. The Kontinental Hockey League’s leading scorer and Olympic MVP had plenty of suitors and wound up agreeing to a three-year deal with the Los Angeles Kings worth $6.25 million a season. The 35-year-old is returning to the NHL on the same deal Patrick Marleau got from the Toronto Maple Leafs a year ago, which is a coup for Kovalchuk. Rumors persisted about Montreal trading captain Max Pacioretty or even acquiring center Ryan O’Reilly from Buffalo. Neither move happened, leaving Marc Bergevin with a lengthy to-do list after already trading Alex Galchenyuk to Arizona for Max Domi.